There are plenty of characters and symbols your Mac can produce that you won’t find on your keyboard. Things such as ©, ¢, ™, and, yes, 😊. OS X offers a couple tools for finding these characters: The Keyboard Viewer shows you a graphical representation of your keyboard; press various combinations of modifier keys to see the characters and symbols you can type. (For example, it shows that you can type ™ by pressing Option+2.) The Character Viewer shows you all the symbols, special characters, and non-Roman characters you can use, separated into categories. You can browse characters or use the search box to find a particular item; double-clicking a character pastes it into the front-most text field. But if you frequently type special characters, a more-convenient option is Characters (Mac App Store link). Whenever you need to “type” a special character, you just click Characters’s systemwide menu-bar icon or—my preferred method—press a keyboard shortcut. 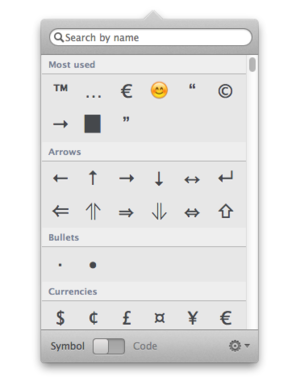 The popover that appears shows a scrolling list of available special characters, divided into sections: Most Used (the ones you access most frequently, for quick access), Arrows, Block Elements, Bullets, Currencies, Cyrillic, Digits, Dingbats, Emoji, Geometric Shapes, Greek, Hebrew, Latin, Latin Extended-A, Letter-Like, Math, Parentheses, Pictograms, Punctuation, and Symbols. You can disable, in Characters’s preferences, any categories you don’t use. 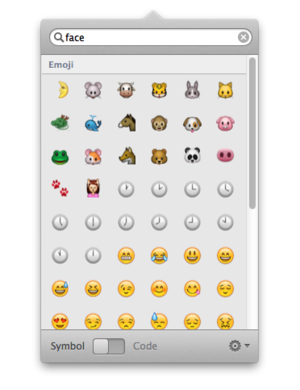 However, you can’t reorder the sections—I’d like to put Punctuation near the top of the list and Emoji at the bottom. I also wish you could collapse less-frequently used sections without disabling them completely, so you didn’t have to scroll through them all the time. Thankfully, you can make the popover longer to show more characters at once. If you know the name of the character you’re looking for, just start typing it in the search field; Characters filters the popover’s contents to show just those characters that match your search. For example, typing trade displays ™ and ®. (Tip: You can type the name of a category to show just that category.) One thing that would make this feature a bit more useful is if Character viewer would show the name of a character when you hover the pointer over it—knowing a character’s name would make for easier searching the next time you need that character. Once you’ve found your character, you simply click it—or, if you’re a keyboard jockey, use the arrow keys to select the character and then press Return—to copy it to the Clipboard for pasting elsewhere. By default, Characters displays a Notification Center alert confirming the copy. (You can disable this feature in the app’s preferences, but doing so didn’t actually stop the notifications for me, which I’m assuming is a bug.) I wish Characters could automatically paste the selected character into the frontmost text field, instead of requiring you to manually paste, but that’s a minor complaint. Characters also offers an option that will be very appealing to coders: Flip the big switch at the bottom of the popover from Symbol to Code, and Characters will instead copy the selected character’s code representation—as either Python source or the HTML entity’s name, decimal representation, or hex representation—to the Clipboard. Which means you never need to remember if an opening smart quote is &#8220 or &#8221. You can quickly search for particular characters. I can’t be sure—I didn’t count them—but it appears that Character Viewer offers a wider range of characters, especially in the Pictograph category. But many of the extras are obscure things you aren’t likely to use regularly unless you have very specific needs. I especially like that I can use Characters without ever lifting my fingers off the keyboard. For me, Characters is an easy, and visually attractive, solution that’s faster than accessing and using Character Viewer.